Thursday February 7, 2019 - Exiled lawyer, Miguna Miguna, has shifted goal posts claiming that former Prime Minister Raila Odinga will become President in 2022 going by what is happening in Kenya currently. In a tweet, Miguna also said that the referendum, which is being spearheaded by none other Raila Odinga and backed by President Uhuru Kenyatta, is inevitable. He predicted that the nation will be subjected to a referendum before 2022. 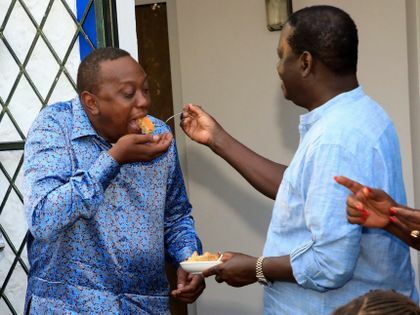 This, he claimed, will open the way for more joint moves in the future between Uhuru and his friend, Raila, including a political union before the 2022 General Elections which will leave out Deputy President William Ruto. Miguna claimed that Uhuru will, in 2022, endorse Raila for the Presidency, but with an immoral motive. “In 2022, Kenyatta neuters RAO and executes a Kabila-style," Miguna said in reference to the recent DR-Congo elections. Miguna was ejected from Kenya last year for illegally swearing in Raila Odinga as the People’s President. He has since blamed the former PM for his woes.